After I, Lucifer, it seemed somehow appropriate to balance out something that cynical with the epitome of Christian parables masquerading as children's fiction. 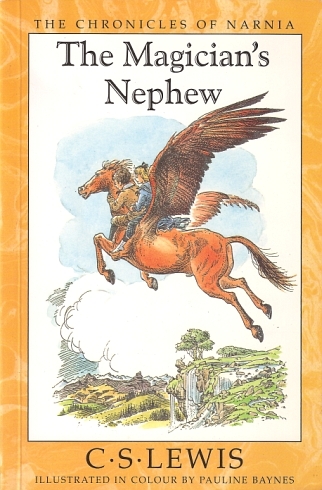 Hence I am starting my third attempt at reading the Chronicles of Narnia, see if I can get further than The Horse and his Boy this time. The Magician's Nephew follows Digory and Polly, two young children who find themselves in a strange other world after Digory's obviously evil Uncle Andrew tricks them into helping with his magical experiments. They soon find themselves stuck with the Evil Empress Jadis and must find a way to send her back to her original world. Polly: You look like you've been crying. Digory: Oh really? Maybe because MY MOTHER IS DYING! I don't know about you, but there is something about that subject matter that requires a touch more subtlety and build-up than it's really afforded. What should be solemn is made more absurd than anything. The other thing that struck me reading The Magician's Nephew was that there are two sequences that really stand out from the rest of the book. First is the scene where Aslan creates Narnia, and second is the scene where Digory fetches the magical apple for Aslan. These scenes are noticeably prettier than the rest of the novel, where the pace doesn't feel quite as frenetic and the writing has a little chance to breathe. I can't help but notice that these are the passages with the most obvious parallels to Christian narratives, Creation and the Garden of Eden respectively. Considering how much better these passages are compared to the rest of the book, I can't help but wonder whether these were the scenes that Lewis wanted to write in the first place, with the rest included as a token attempt to give it some context. It does make the rest of the novel feel kind of disappointing.